What is the Middle East Respiratory Syndrome (MERS)? The viral respiratory disease, Middle East respiratory syndrome or MERS is known to be caused by a coronavirus called MERS-CoV. It was first discovered in 2012, in Saudi Arabia. These viruses belong to a large family of viruses recognized for causing common cold, flu, and acute respiratory syndrome. The source of the virus MERS-CoV is still not clear though. MERS has been reported in approximately 25 countries across the globe. They are Austria, Iran, Lebanon, Jordan, Qatar, Greece, Kuwait, Oman, Italy, Saudi Arabia, United Arab Emirates, Yemen, Germany, France, Algeria, Tunisia, Netherlands, Turkey, the United Kingdom (UK), Europe, Egypt, China, Malaysia, Republic of Korea, Philippines (Asia), and the United States of America (Americas). 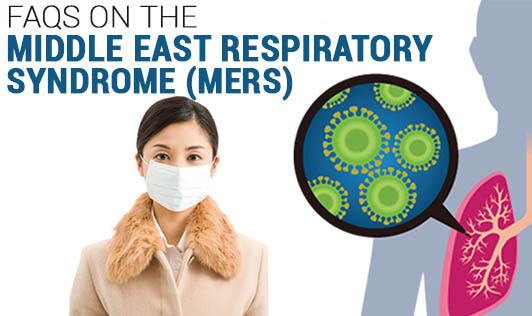 What are the symptoms of MERS? How severe is the syndrome? The common symptoms of MERS include cough, fever, breathlessness, and sometimes gastrointestinal trouble as well. Some patients have also been observed having organ failure, especially the kidneys. This virus spreads faster in people with low immunity, diabetes, lung ailments, and cancer. Can a person be infected with the MERS virus and not be ill? Yes, there is a possibility of being asymptomatic despite being infected. The early symptoms are non-specific, and therefore infected people with no symptoms have been found. How do people get MERS-CoV? MERS-CoV has been found in camels in Middle East countries, like Oman, Qatar, Egypt. It is believed that human beings catch the infection directly or indirectly from these animals. Unless there is very close contact, it is not easy for MERS-CoV virus to pass from one human to another. However, strict hygiene measures must be taken to avoid infections. The majority of human-to-human transmission has been noticed in health care settings. This virus does not easily seem to pass from person to person, until and unless there is close contact. There have been many cases in healthcare setups where this infection has been known to spread. This happens primarily due to lack of hygiene in the healthcare facilities. Is there a vaccine against MERS-CoV? What is the treatment? No, currently, there is no vaccine or specific treatment available. Other modes of treatment are wholly based on the clinical condition of the patients. Milk, meat, or other such undercooked or raw animal products carry a high risk of infection, if consumed. They contain a variety of organisms, which are known to spread infection in the human body. The animal products that are pasteurized or cooked safely are safe for consumption. Until more is written or understood about MERS, people with renal failure, lung diseases, diabetes, and weak immunity will be considered high risk. People should also avoid direct contact with animals, especially in the Middle East, where this infection has largely been found.